Blood chemistry studies: A procedure in which a blood sample is checked to measure the amounts of certain substances, such as bilirubin, released into the blood by organs and tissues in the body. An unusual (higher or lower than normal) amount of a substance can be a sign of disease. Tumor marker test: A procedure in which a sample of blood, urine, or tissue is checked to measure the amounts of certain substances, such as CA 19-9, and carcinoembryonic antigen (CEA), made by organs, tissues, or tumor cells in the body. Certain substances are linked to specific types of cancer when found in increased levels in the body. These are called tumor markers. Abdominal ultrasound: An ultrasound exam used to make pictures of the inside of the abdomen. The ultrasound transducer is pressed against the skin of the abdomen and directs high-energy sound waves (ultrasound) into the abdomen. The sound waves bounce off the internal tissues and organs and make echoes. The transducer receives the echoes and sends them to a computer, which uses the echoes to make pictures called sonograms. The picture can be printed to be looked at later. Laparoscopy: A surgical procedure to look at the organs inside the abdomen to check for signs of disease. Small incisions (cuts) are made in the wall of the abdomen and a laparoscope (a thin, lighted tube) is inserted into one of the incisions. The laparoscope may have an ultrasound probe at the end in order to bounce high-energy sound waves off internal organs, such as the pancreas. This is called laparoscopic ultrasound. 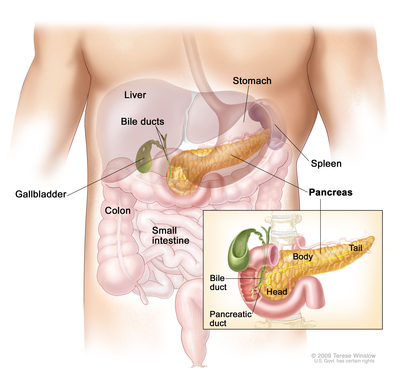 Other instruments may be inserted through the same or other incisions to perform procedures such as taking tissue samples from the pancreas or a sample of fluid from the abdomen to check for cancer.